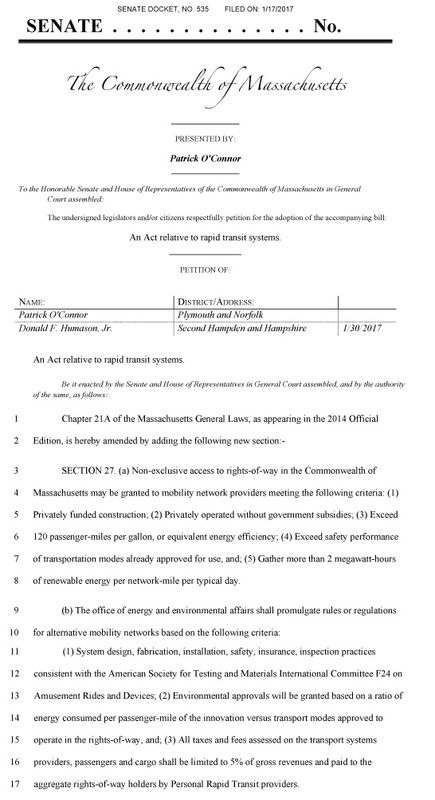 As: Secaucus Law 2014-23 and Massachusetts Senate Bill SD629, S1970, S2302 Section 113 (Omnibus Climate Change Bill). H4714. It may take time to get adoption, 2015 hearing with Boston City Council. (v) that are above ground gather more than 2 megawatt-hours of renewable energy per network mile per typical day. (iv) provided, taxes and fees assessed on solar and renewable energy mobility network providers, passengers and cargo shall be limited to 5 percent of the gross revenues and shall be paid to the aggregate rights-of-way holders by the solar or renewable energy mobility network provider. For capital and innovators to risk, the law must be clearn and well established. Are widely used and well established. Are tailored to pedestrians, especially children. Cities should be designed around pedestrians, not cars. Machines should adapt to people. Have an existing enforcement industry. Have an existing insurance industry. Have an existing common law. This is very important because privately funded transportation networks will not have the sovereign immunity that protects DOT from poor safety performance. ​ASTM injury rates are 0.2 per million. The digitizing of communications networks, replacing analog networks with digital networks, required decades to get the regulation correct. 1968: "The Mother of All Demos" demonstrated nearly every aspect of modern computing and the Internet. A video is below. If you start at 29 minutes and watch for 5 minutes you will see graphical navigation, the mouse, video conferencing, and more. 1982: The Federal communications monopoly created on Aug 1,1918 by Executive Order was declared unconstitutional. Elon Musk has made progress in Maryland. This 1994 news cast illustrates how expectations at one point are entirely backward sounding today. All applications of technology to networks must keep ahead of expectation to remain relavant. Networks are dynamic processes, not static technology.